Jaujan (second right) looking at Taman Sri Lemawang’s model house. Also seen are Gordon (right), Wences (left) and Wong (left). 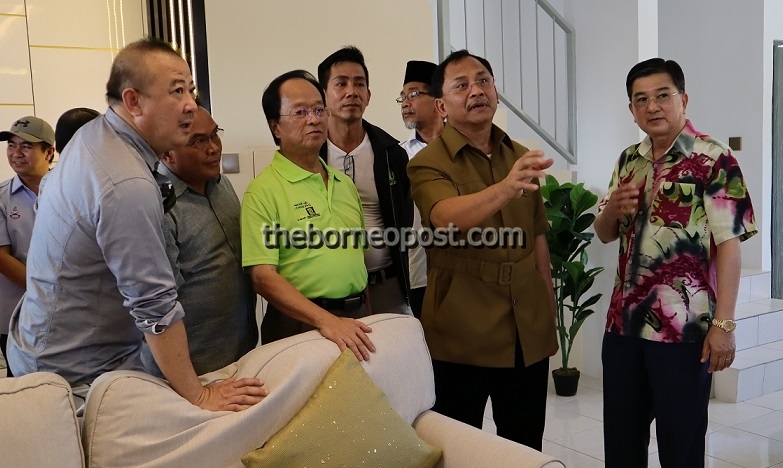 TUARAN: Deputy Chief Minister Datuk Dr Jaujan Sambakong has disclosed that 832 units of affordable houses will be built at Taman Sri Lemawang here using the Industrialized Building System (IBS) technology. He said the use of the IBS construction method was recommended by the government through the Construction Industry Development Board (CIDB). Jaujan expressed confidence that houses built using the IBS technology could provide quality, beautiful and affordable housing to the people. “The use of this technology can facilitate and save time on the completion of the project here, which is the third joint venture between the Housing and Urban Development Board (LPPB) and KTI Sdn Bhd,” he said during a press conference at the soft-launching of the model house of the housing project yesterday. Jaujan said the need for adequate housing in Sabah is crucial and he did not want to see more commercial premises being built than houses. He said the present government wants to achieve a balanced development, which is to develop the economy by building more factories and so on, but, at the same time, also building more houses for the growing population. “Based on the main performance indicators of the Ministry of Local Government and Housing (KKTP), LPPB has set 90 low-income households to get housing this year through the Low Income Housing Loan Scheme (SPPUGBR). A total of 132 houses will be built for the Low Cost Public Housing Program (PAKR) this year,” he said. Jaujan, who is also the KKTP minister, said, his ministry is striving to improve the quality of the people’s well-being and would start two People’s Housing Programs (PPR) from 2019. He said KKTP had also taken the initiative to resolve the squatters issue by relocating the squatters to housing areas. According to him, KKTP will create a squatters information system as a reference to the government agencies in making better policies and planning. In his speech earlier, Jaujan called on housing developers to provide quality and affordable housing for the people, especially to those from the lower income group. He also reckoned that it is important for housing developers to approach and hold discussion with government agencies like LPPB if they want to build houses in Sabah. He said through discussion, LPPB can provide land and the government can also assist in identifying the land that is strategic and suitable for housing project. He also stressed on the need for government supervision on housing projects to avoid problems such as work quality, unplanned electricity supply and unplanned development plan and so on. “There are cases where houses have been completed but the certificate of occupation (OC) was not issued … this is what had happened (in the past) and in the new Sabah Government, we do not want this thing to happen again,” he stressed. He said before the housing project is implemented, the developer has to ensure that all the infrastructure facilities were in order to avoid any delay in completing the project. Also present were LPPB chairman Tan Sri Wences Angang, KKTP deputy permanent secretary, Wong Foo Tin, LPPB general manager George Liew, KTI Sdn Bhd chief executive officer Dr Gordon Loke, and project director of KTI Sdn Bhd, Wilson Loke. The Taman Sri Lemawang housing project will be implemented in stages using IBS technology. Phase 1A of the project is currently underway comprising 88 units. It is expected to be completed within a year. The price per unit is from RM250,000.